How is it that we're already in the 2nd week of November? Sometimes I feel like time drags on, but then when I realize what day it is, it's like time just flew by without me even realizing it. I promise I will get to Thanksgiving and all of its trimmings soon, but before I do I just had to share with you these images from Adore Magazine. I saw them on Pinterest and immediately fell head-over-heels-in-love with everything about this space. So much so that I'm thinking that when it comes time to redo my home office, this is how I want it to look. I mean, how gorgeous is this room?? 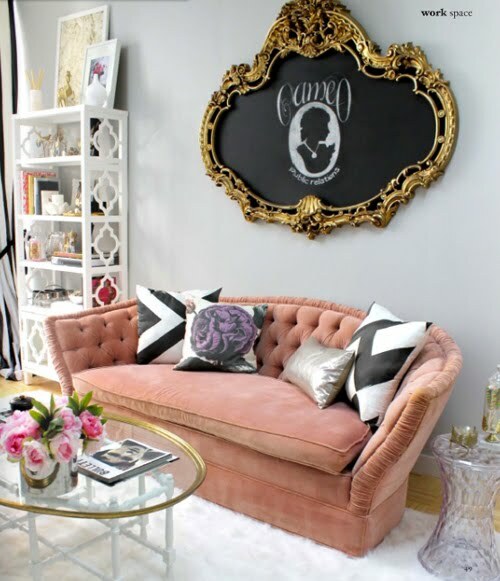 Absolutely glamorous and girlie, yet the black & white color scheme really keeps it from getting too frilly and frou-frou.